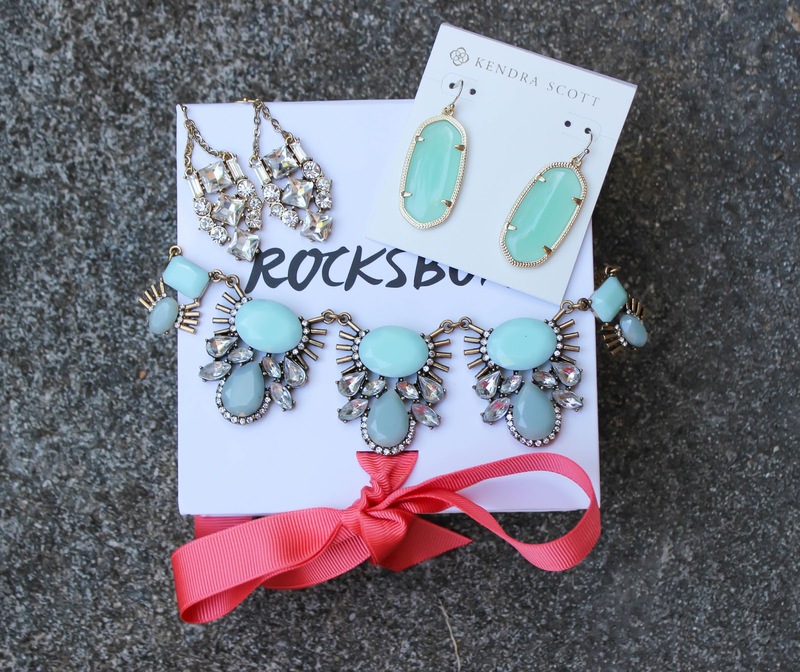 I’m in love with my Rocksbox this month. If you’ve followed along my Rocksbox journey, you know that most months my Rocksbox is out of this world amazing, but last month was a little disappointing, although their customer service impressed me. This month my Rocksbox was a hit once again and I’m struggling to decide what to keep and what to send back and I’m running out of time so I need your help! What is Rocksbox? It’s a subscription jewelry service – for $19 a month they send you 3 pieces of high-end jewelry from designers like Kendra Scott, Loren Hope, and Moon & Lola (just to name a few) on loan for the entire month. To determine what they send you Rocksbox has you fill out a style survey and add items to your wishlist so your stylist gets a feel for your personal style, and you can even request specific pieces off your wishlist from your stylist. At the end of the month you can purchase any of the pieces from your set at a really awesome discounted price, and you get $10 credit each month towards buying any of the pieces from your set, and in addition you earn credit to any friends you refer who sign up for Rocksbox! Want to give Rocksbox a try? Just use the code “cervinoxoxo” for your first month completely free! So let’s dive in. My favorite thing about Rocksbox, and I say this every month, is that it gets me to try jewelry pieces that I would never pick out for myself. And those are always the pieces I end up keeping. 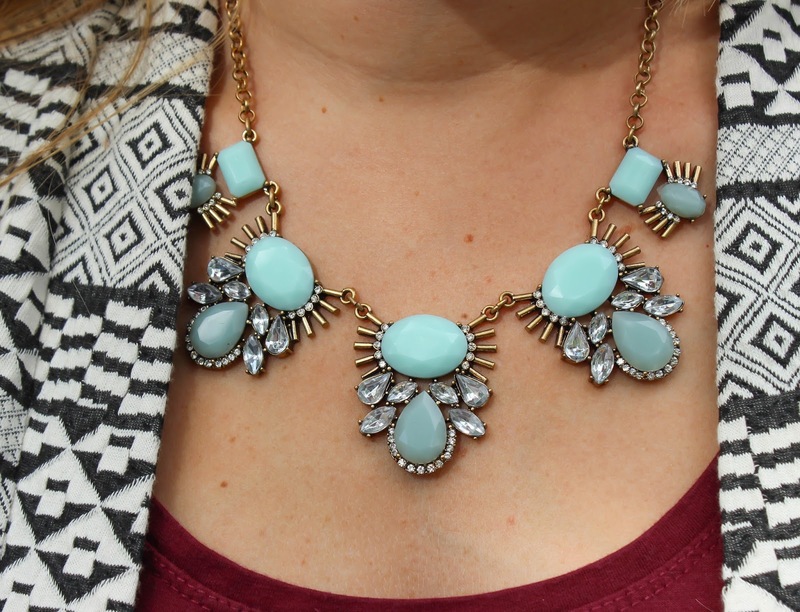 This Paisley necklace by Urban Gem is just that. My first thoughts were too clunky and too much spring color going on when it’s now fall. 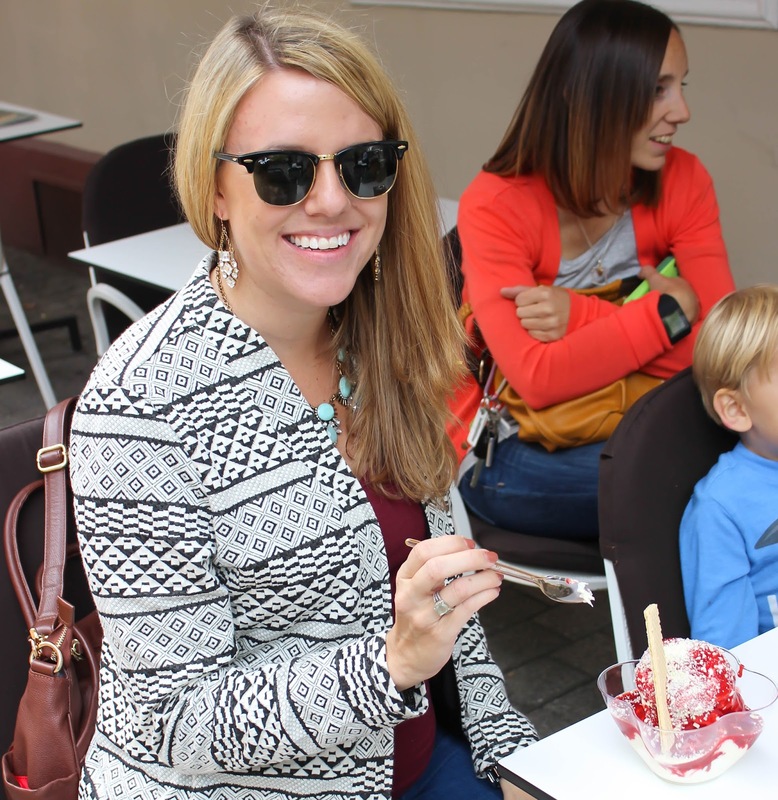 But this necklace pairs so nicely with cranberry and black, and transitions really well into fall. Plus I love the way it lays and the style of it. It adds a very classy touch to casual outfits. My only qualm is that it’s more than I usually spend on necklaces – it retails for $64 but Rocksbox subscribers can purchase it for $51 – if I apply my monthly credit it will be $41, which still seems like a lot for a necklace! Although I do love it… tough decision! 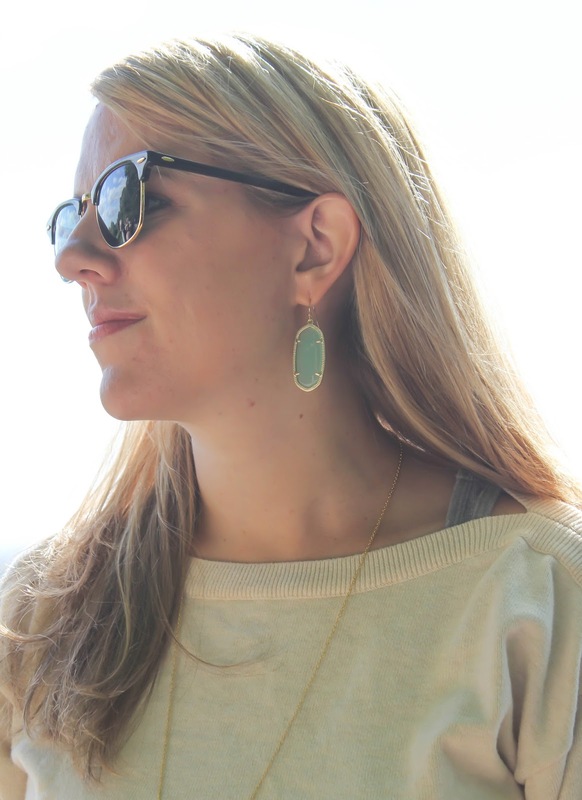 Next up is what I was most excited about opening my box – Kendra Scott Elle earrings in Chalcedony. Once again I was a little concerned that they looked to spring-like, but after wearing them with a couple different outfits I don’t think that is a problem. 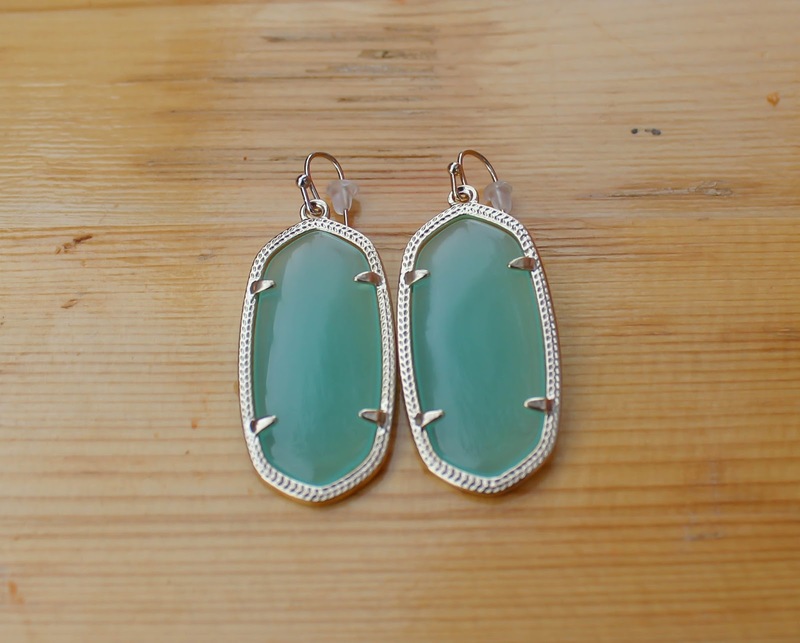 These earrings are super trendy at the moment, and the color of these is gorgeous. I’m fairly certain that I’m going to end up keeping these one moment, and then the next I think oh I usually wear neutral earrings so maybe I should pass. They retail for $55 and Rocksbox subscribers can purchase them for a great deal at $44. Once again I could apply my monthly credit and bring them down to $34, which doesn’t seem bad at all! And last but not least are the Perry Street Daisy Crystal Earrings. I pretty much wrote these off when I opened my box and figured they were definitely not keepers. But then I wore them a couple times on our Germany trip and found myself liking them. They are way louder than earrings I typically wear, but I like that about them. And they are great for dressing up outfits that I don’t/can’t wear a necklace with. I’m leaning towards sending them back at the moment, although I don’t have anything like them and did find them to be a really fun piece. They retail for $50 but Rocksbox subscribers can buy them for $40! If you want to jump in on the Rocksbox fun just use the code “cervinoxoxo” for your first month free – no reason not to! And as always I need your help! What should I keep? Send back? I’m yet to keep all 3 pieces from a set – could this be the one? Let me know your thoughts below! I recently got the chalcedony KS earrings and love them too! They're the perfect color! Love that jewelry set! Never heard of this subscription before, I'll have to do some research! I'm always looking for new jewelry!